​AAE welcomed Gypsy and her filly, Calico Girl, from the DreamCatcher Wild Horse and Burro Sanctuary in April of 2018 to support their herd reduction efforts after the long illness and passing of their Executive Director, Barbara Clarke in November of 2016. 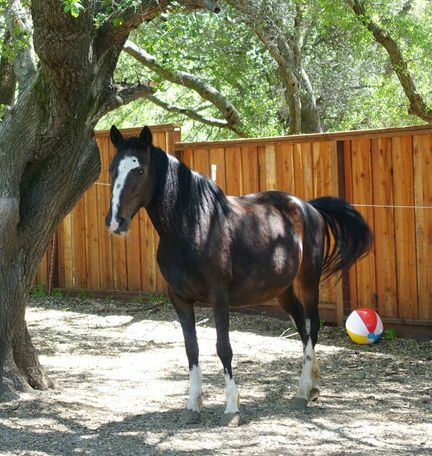 Gypsy is a pretty and stout mare with a curious and confident nature. She is a mare-ish mare with a mind a bit of her own in the herd.. Gypsy had been haltered and handled prior to arrival. That being said, she was resistant to the whole idea of leading when she arrived at AAE. After some time settling in and socializing, her willingness has grown. She's still a work in progress. She has a bit of a stubborn streak, but with gentle persistence, she offers a lot of try. Gypsy is preparing for dental work. She'll be looking for a home soon after her filly is weaned and she's brave enough for a hoof trim. She'll be current with vaccines and deworming.